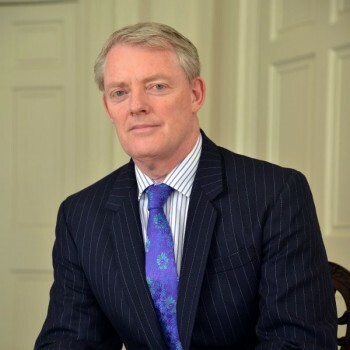 Sandy Nairn, the CEO of Edinburgh Partners, has made a number of timely strategic calls in interviews with me over the years. In this extended Q and A, seven years on from the global financial crisis, he argues that the world is close to returning to a more normal set of conditions. The threat of deflation which policymakers have spent so much energy resisting has now receded, and the most likely path from here is that inflation will pick up, real bond yields will return to positive levels and value investors will have their day in the sun in the equity markets once more. A further move towards protectionism and competitive currency devaluations, risking a global trade war, is the most serious risk. You correctly identified major market turning points in 2003, 2007 and 2009. Now something else seems to be changing; can you explain what you think that change could be? Sure. My sense is that we are nearing the end of the unusual monetary and economic conditions that we have all had to get used to living with since the global financial crisis. The disinflationary, low interest rate, low-growth environment – it is not going to go on forever, despite what many people seem to think. We have had seven long years of retrenchment and monetary activism, but that is about to change. The first signs of a different kind of environment are now becoming apparent and they should lead to some significant changes in what does and does not work as an investment style. Real interest rates are going to return to more normal levels. Value is going to make a comeback. That is my thesis. It is not baked in as an outcome – misfiring politics could still derail it – but it remains the most probable outcome in my view. Are you saying that the global financial crisis is finally over? Not exactly, but we are close to getting there. We need to remind ourselves that the global financial crisis of 2007 was the first time since the 1930s that the world’s financial system became sufficiently stressed that there was a real possibility of it collapsing. Excess leverage, poor quality lending and insufficient regulatory oversight all conspired to create a fragility in the banking system, one in which the capacity to absorb losses was non-existent. This potentially catastrophic situation elicited a policy response whose intellectual underpinning rested on the experience of the Great Depression. In order to prevent a disastrous combination of bank failures, monetary contraction and falling asset prices, the system was flooded with liquidity. The banks were bailed out on whatever scale was necessary. The cost of money was kept low. 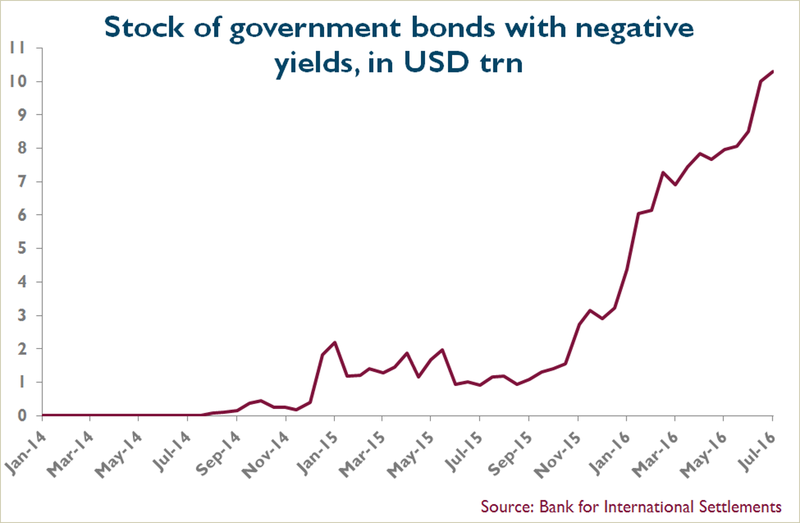 Central bank purchases were used to inflate sovereign bond prices, causing a ripple effect on other asset markets. Free trade remained a central plank of policy, so as to avoid the trap of populist protectionism that had been so damaging in the 1930s. Finally, the regulatory regime was rebuilt with the aim of making it impossible ever again for failures in the financial sector to bring down the entire global economic system. The critical policy target was the avoidance of deflation in a world characterised by excess debt. These policies have been successful in keeping the global economy from entering a 1930s-type depression where debt default produced a severe and prolonged deflationary economic contraction. But they also mean that the last seven years have been very different from the experience of normal economic cycles. Balance sheet repair has been the order of the day. The typical anti-inflationary response of policymakers to signs of cyclical overheating has been held in abeyance. Stressed financial sector, household and government balance sheets all required rehabilitation. In turn rehabilitation required both refinancing and a prolonged period of economic recovery. Only now are we emerging from this phase of the recovery. But has the risk of 1930s-style debt deflation really been eliminated? I think so. There is an important distinction here. Deflation is defined as a generalised fall in the price level and will normally show up as negative inflation. Negative inflation however is not necessarily deflation. This distinction is important. Productivity increases which cause the price of a good to fall do not create deflation, as the additional disposable income those productivity increases create is still available to be spent. You only get sustained deflation when falling incomes and product prices combine to make consumers postpone consumption, leading to a self-reinforcing downward spiral of production declines, job losses and increased bad debts. Since the financial crisis we have seen incremental disposable income being devoted to balance sheet repair rather than consumption. That is a logical outcome. It is no surprise that headline economic growth has been stubbornly low as a consequence. This is simply the mirror image of what happened before the crisis, when several years of above-trend economic growth was funded by excessive credit growth. However, the greatest risk of the crisis was that negative consumer psychology would take hold and drag us down into a repeat of the 1930s. That is the risk which I think policymakers have managed successfully to avoid with their actions this time round. Even though their policy response may have had other unhelpful consequences? In other words, QE was an official government policy to augment the traditional monetary policy of reducing short-term interest rates. It was initiated in the US by the Federal Reserve in November 2008, but progressively adopted across the world, by the UK in 2009, by Japan following the election of Mr Abe in 2012, and by the European Central Bank earlier this year. The specific initial goal was asset price inflation and it has certainly worked in that respect. As bonds were purchased and yields suppressed, investors have been sent on a global search for yield. Just as the policymakers intended, there has been a ripple effect towards higher risk assets across investor portfolios. In the bond market, yield spreads have narrowed and both equity and bond markets have risen. It is worth noting, however, that this process has been far from uniform in its outcomes. Against a general backdrop of anxiety and uncertainty, investors have periodically become fixated with wider conflicting concerns – about a return to the deflationary conditions of the 1930s on the one hand, and fear of future inflation as a result of loose monetary policy on the other. While all asset prices have ultimately moved higher, sentiment has swung back and forth between bonds and equities. Within equities, investor favour has alternated between companies deemed to be able to grow through tough economic conditions and those who could not. These swings in mood and performance have produced a now familiar pattern of alternating periods characterised as ‘risk off ’ and ‘risk on’. The downside of QE and loose monetary policy, however, is that it has taken valuations of many assets to historically extreme levels, has it not? Without question. If one looks at the real (inflation- adjusted) yield on US bonds, during the 1980s and 1990s real yields were rarely below 3.0%. But look at the chart now and you can clearly see that it has been trending lower since the turn of the century and, since the advent of QE, tending towards zero. At certain points, though rarely sustained for long, fear of outright deflation has produced negative real yields. Currently, with the CPI at 1%, and the nominal yield approximately 1.6%, the real yield is around 0.6%. However if you use a different measure of inflation, so-called ‘core inflation’ (which excludes volatile food and energy prices and is currently running at over 2%), the real yield is actually negative today. That is dangerously low if we are anywhere close to a return to normality. With CPI at 2%, for real yields to get back to even 1%, then bond prices would need to fall by around 20% – and by more if we go back anywhere close to historic averages. If one accepts that bonds should be priced to produce a real yield, it follows that what we have today is a severe case of policy-induced overvaluation. In the case of the US 10-year bond, we know that the temporary effect of lower energy prices on the CPI is in the process of washing out of the numbers. Other markets provide little comfort. The Bank for International Settlements recently estimated there are now more than $10tr of bonds on negative real yields outside the US, most of them either in Europe or Japan. The number has been accelerating in the past few months. Turning to the equity market, the picture looks very similar. 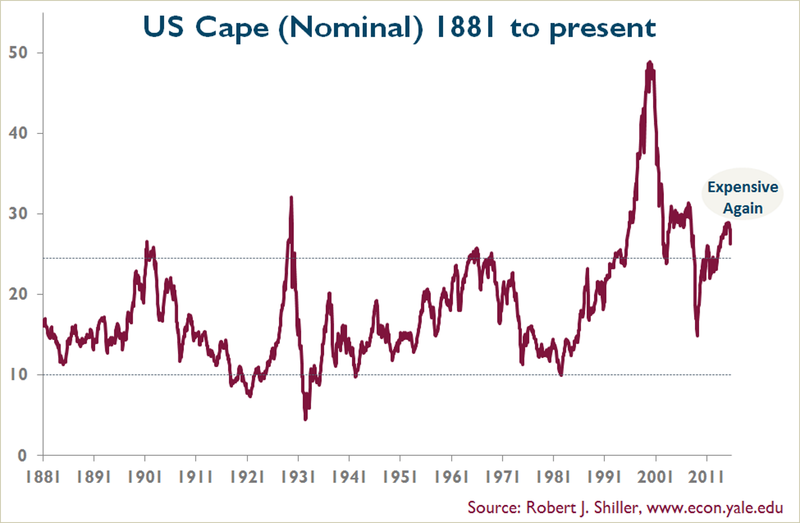 If one looks at the cyclically adjusted PE (or Shiller PE) on US equities, it is at a level that has never been sustained historically. It has only been exceeded at the peak in the Internet bubble, and immediately before the 2007 financial crisis. Whether you use this or other valuation measures, it is clear that a lot of equities are also very richly valued. Might not there be a more benign reason why valuations have risen to these heights? In isolation there is always a respectable argument which can be deployed to explain high valuations. 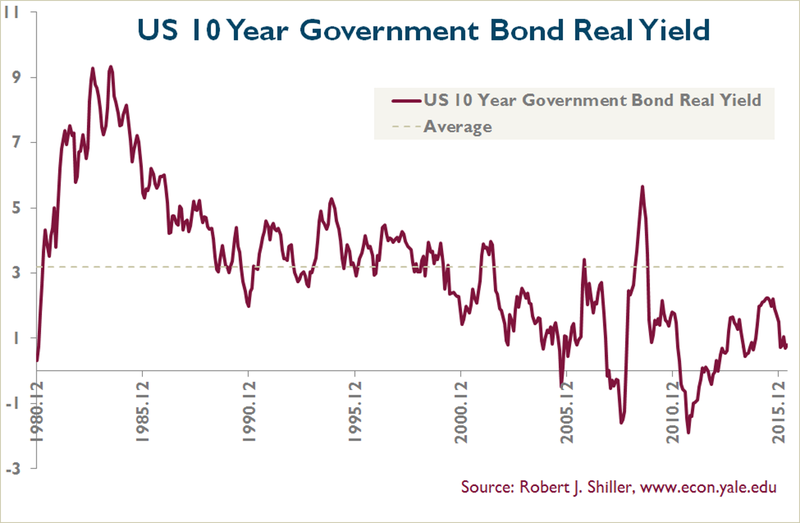 For example, real bond yields might plausibly be expected to remain low for an extended period if the expectation was for an extended period of subdued global economic growth. Similarly, some might say that equity valuations will remain high because future economic recovery will boost future company earnings sufficiently to justify the historic valuation. The problem is that these two explanations are obviously in conflict! It is exceptionally difficult to sustain an argument that can underpin valuations in both markets at the same time. It is true that you could argue that a combination of rapid growth and zero inflation might simultaneously prevent real bond yields rising and underpin equity valuations. If you discount equities at the risk-free rate, it follows that the lower the rate, the higher the equity valuation you can justify. In normal times that argument is persuasive. Markets set the risk- free rate based on embedded expectations. To arrive at valuations, equity markets blend the effect of the risk-free rate and their expectations for real growth. A very low risk-free rate pushes valuations higher, and that in theory can offset the impact of gloomy growth expectations. That would certainly explain why the biggest impact has been on ‘bond proxies’. Unfortunately I don’t find this narrative convincing any more. It rests on the assumption that these are normal times and the risk-free rate is being set by the markets, rather than by central bank intervention. The most likely explanation for high valuations is the obvious one. It is that higher asset prices are what policymakers have been trying to achieve through yield suppression – and the policy has been a success. 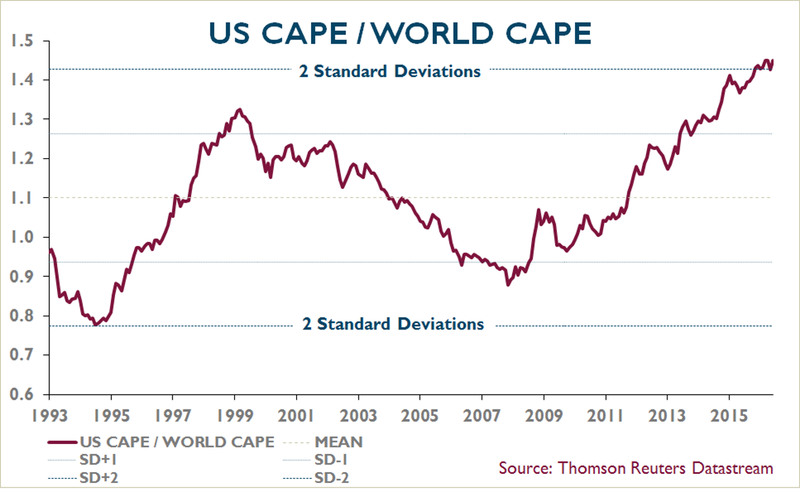 It is no accident, for example, that the US, the country with the greatest perceived stability, has seen the sharpest increase in equity valuations. You can see that very clearly if you compare US earnings per share growth to that of the supposed sick economy of Japan. 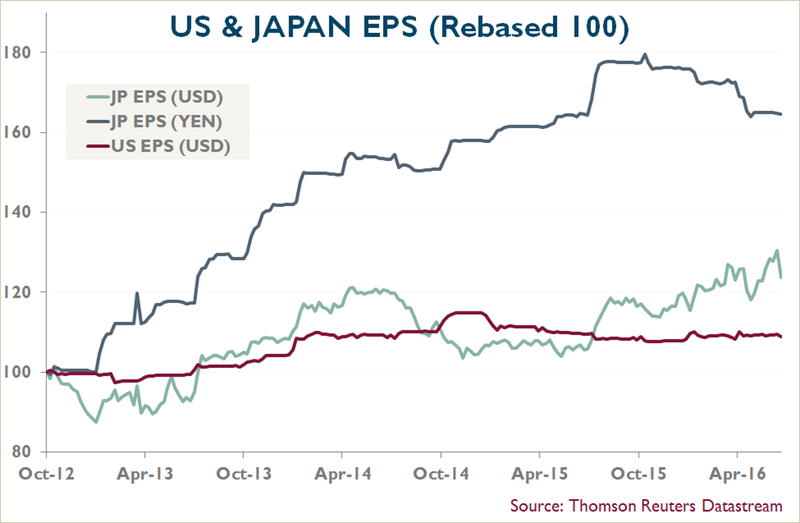 Whether the Japanese earnings per share are measured in yen or US dollars, growth over the past five years has still outstripped that of the US. 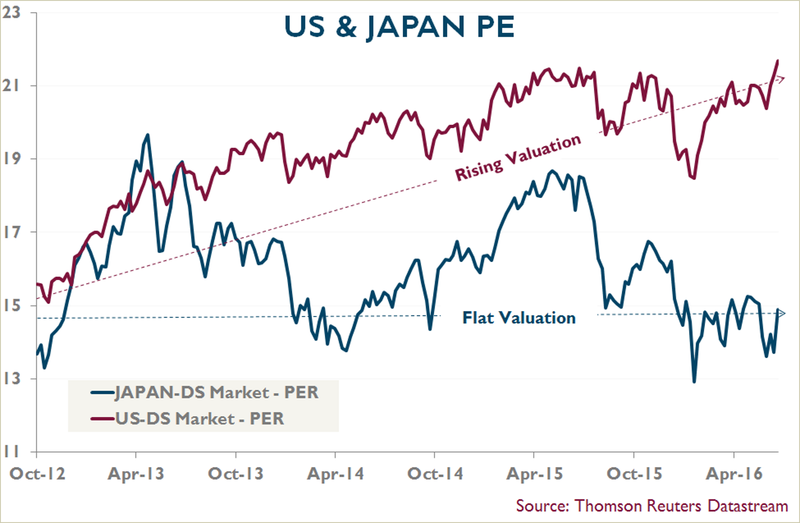 Yet even the most cursory inspection of the two markets’ PE multiples shows how that of the US has continued to expand over the period, despite the sluggish earnings, whilst that of Japan has changed little, in spite of the earnings growth. You can also see this effect in a comparison of cyclically adjusted price earnings ratios between the US and the rest of the world. The valuation of the US market has been rising steadily since the financial crisis and continues to hit new highs. A similar picture emerges if, instead of geography, you look at the performance of industry sectors on a global basis. Consumer staples are the sector which, in terms of quality and reliability, most closely match the perceived superiority of the US market in comparison with the rest of the world. They are an industry proxy for the same ‘quality/growth’ bias or ‘bond-like equities’. 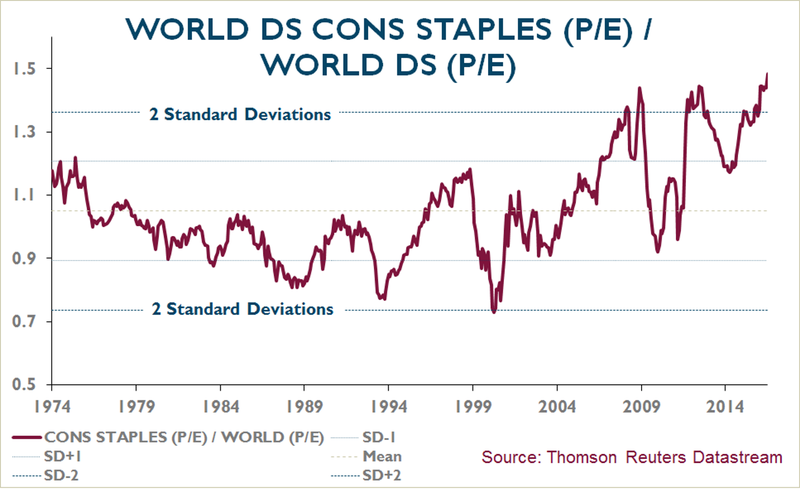 The relative valuation of consumer staples has risen to levels which have never been sustained in the past. Rational or not, why should this state of affairs not persist into the future? What is going to change? Obviously a key question is how the authorities are going to react from here on. It is difficult to infer from equity and bond valuations that anyone expects that the global economy is set for an extended period of strong economic growth. If that were the case, you would not have this paradoxical situation where the equities that are least likely to respond to economic growth carry the greatest premiums and those most likely to do well in a growth environment are among the cheapest. The simplest explanation for high valuations, as I say, is that we are living in a world where asset prices have been deliberately inflated as a matter of policy. The question is therefore how and when that policy might change. What the authorities are looking for is evidence that the economy has returned to a sustainable path and that the financial system is sufficiently robust to withstand any future economic downturn. Given the public debt overhang, my view is that the authorities will in all likelihood refrain from normalising policy until such time as the evidence they are looking for has become unmistakeable. However ‘unconventional policy’ (QE) will be phased out once the evidence has become so clear-cut that action is unavoidable. It does not mean that short-rates have to climb, simply that the policy of deliberately pushing down long yields can end. They can then be left to the market to determine. At that point we will return to a world where Government bonds are once again priced to produce a real yield. This in turn will have a knock-on effect on assets which are directly priced off bonds. Normally a rise in bond yields would produce a negative equity market response, as it would be an indication of policy being tightened to choke off demand in an overheating economy. But given the very different environment from which we are coming, that is less likely to happen this time round. The first signs that unconventional measures are being phased out is more likely to be taken as evidence that we are returning to a stable environment in which the life-support mechanism of QE and yield compression are no longer required. Conventional policy measures such as varying the Fed funds rate remain in place and need only react to the Fed’s view of underlying inflation. As such it should be taken as a sign of confidence in the financial system and a robust self-sustaining economy. Under such circumstances those equities that have laboured under the cloud of potential deflation would benefit, and those which have been favoured from being priced off yields artificially suppressed by central banks would see the opposite move. The second stage, of interest rates rising to combat an overheating economy, would come later. 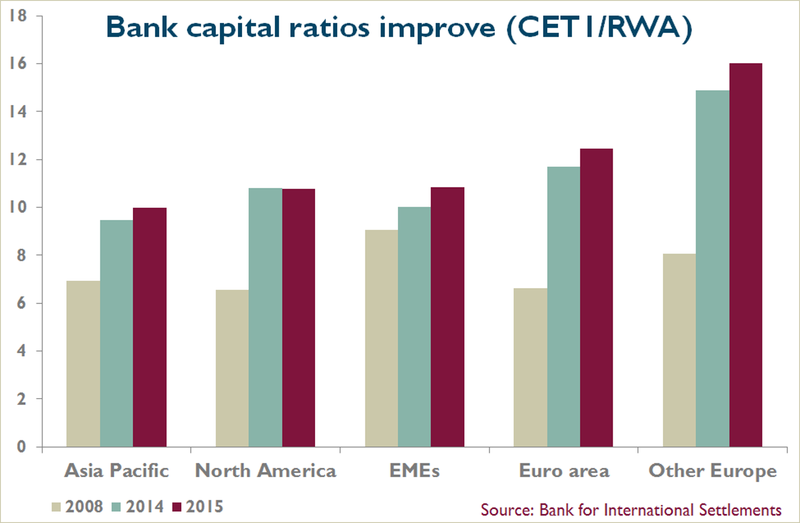 Are bank balance sheets sufficiently strong now to withstand a change in policy of this kind? That is a key question. The global financial crisis demonstrated the need for greater equity buffers for the banking system as well as the need for proper disclosure of contingent and off-balance-sheet risk. Since 2008, regulators globally have repeatedly scrutinised asset quality and progressively required both further write-downs in value and higher capital ratios. In 2008, banks’ Core Tier 1 capital (CET1) divided by risk-weighted assets was generally in the 4–8%range.The level of losses associated with the crisis wiped out the capital of many banks, necessitating massive fundraising and government intervention. Since that time the regulatory regime has gradually tightened in an effort to ensure that in the future the financial sector would no longer be allowed to take on levels of leverage that could risk systematic failure. The measures include changing asset risk classifications and higher capital requirements. Banks have responded by a mixture of raising new equity, shrinking their assets and retaining profits in order to meet the more stringent capital requirements. 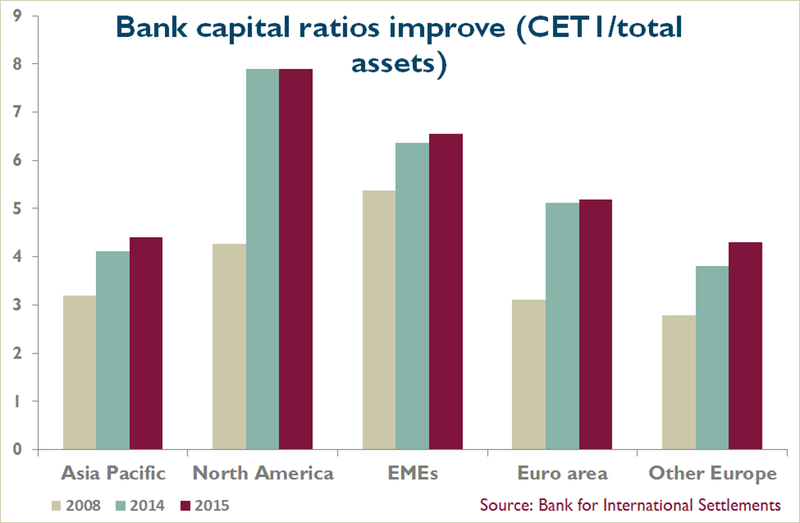 According to Bank for International Settlements data, the core capital/risk-weighted assets ratio of European banks has risen from 4–8% when the crisis hit to more than 12% now. At the same time the banks’ reliance on wholesale funding has reduced so that banks are now much less exposed to the risk of a sudden removal of a funding line. 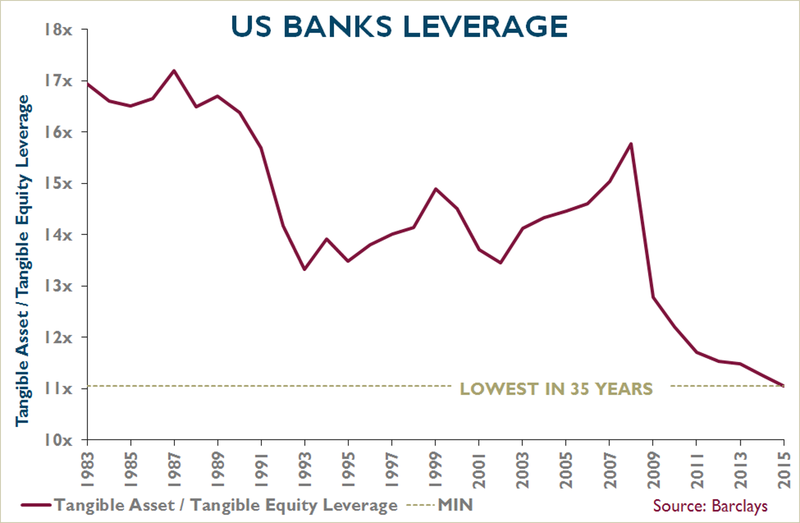 Although not all banks have reached the required capital ratios, and a number have outstanding litigation settlements and non-performing loans (NPLs) that may not yet be fully accounted for, the data clearly suggests that the financial sector is at least as well-underpinned as it has been at any point in the past 35 years. 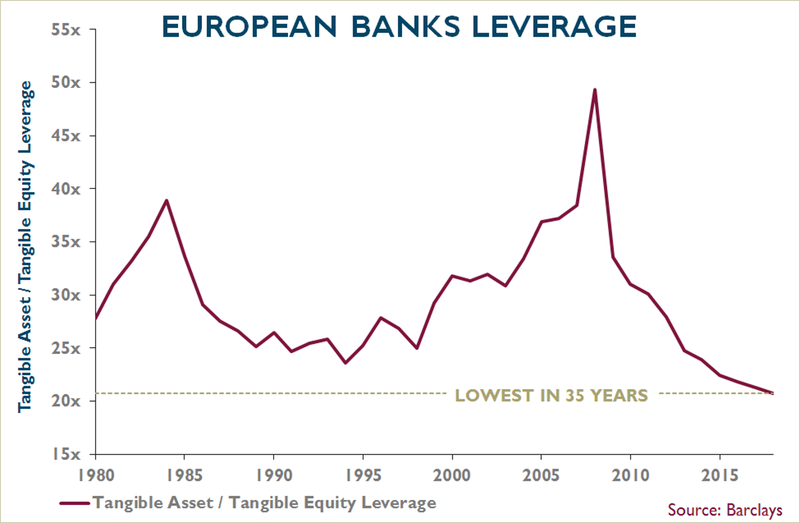 If you look at graphs of the historic leverage of US and European banks, in both cases there is evidence of a more conservative approach to gearing. This does not mean that lending standards have necessarily improved. Nor does it mean that the NPL cycle will not come round again. It is simply that the ability to absorb losses relative to the total magnitude of lending has increased. The increased liquidity of the banks has been partially offset by the burden of increased regulatory requirements which inhibit lending growth. Suppression of bond yields and negative interest rate policy also reduces the ability of banks to make money on lending. Cost-reduction can mitigate the effect of lower revenues, but lower profitability is inevitable. The flip-side, however, is that when interest rates do eventually normalise and the yield curve steepens, there is a positive effect on bank’s profits. The key point is that with their improved capital structure, the banks should now be able to withstand any future normal downturn. In other words we are reaching a point where the unconventional measure of bond purchases is no longer required to assist the solvency of the financial sector. Indeed some would argue that the policy has now turned counterproductive given its negative effect on profitability. What about the health of the global economy – is it strong enough to withstand normal interest rates? The positive news is that the global economy has avoided a financial sector implosion and a return to the conditions of the 1930s. The outlook for GDP remains less clear-cut. According to World Bank figures, global GDP contracted by 2% as a result of the financial crisis. 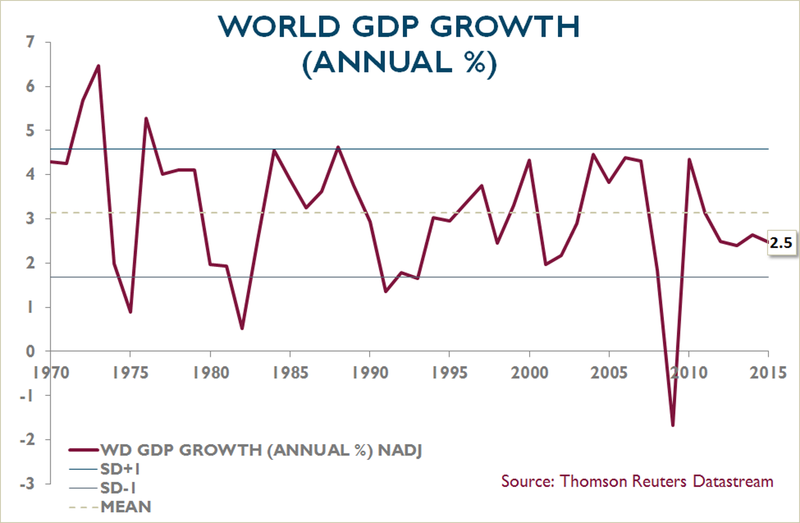 Although the recovery has been muted, real global GDP growth has averaged about 2.5% for the past three to four years, which is entirely consistent with the profile of the past 50 years. Japan and Europe have lagged the US and the fastest growth is still being recorded in Asia, but in aggregate demand growth is still reasonable. Global trade also suffered a sharp fall following the crisis, but this was from an elevated level and remains well above the levels recorded in the 1980s and 1990s. 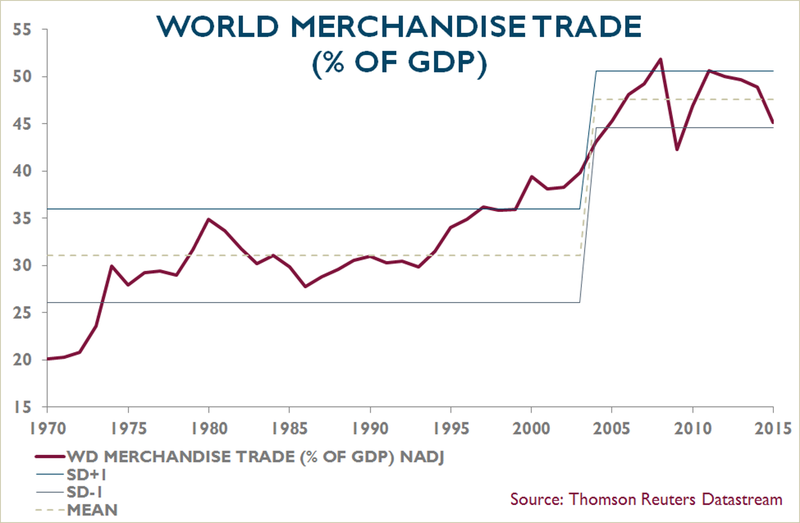 Merchandise trade as a percentage of GDP is currently around 45%, down from its peak, but not a precipitous decline. Whilst global trade and economic growth look reasonable, at first sight the picture on inflation is not so encouraging. 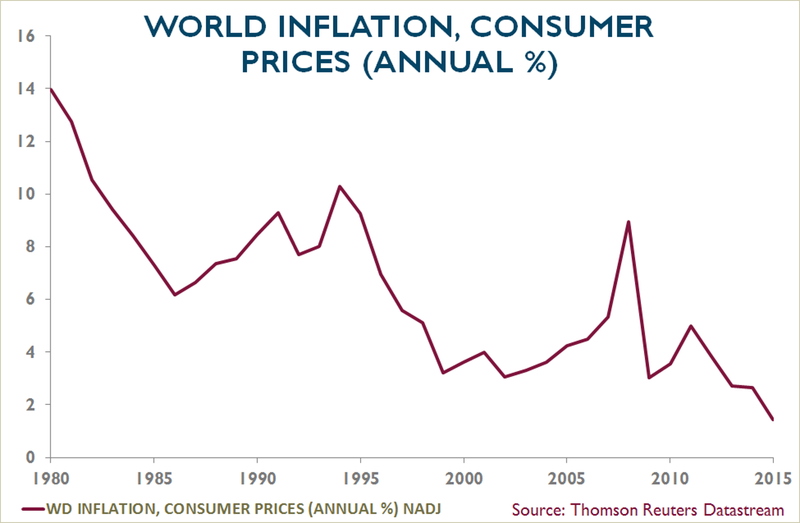 As the graph illustrates, despite record low interest rates it appears that in recent years there has been an inexorable decline in global price inflation. This is one of the anchor arguments for those who see deflation round the corner. However, the most recent decline in the CPI data is largely the result of falls in oil and commodity prices. You can see this from the magnitude of the divergence between ‘core’ and ‘headline’ inflation in the past couple of years. 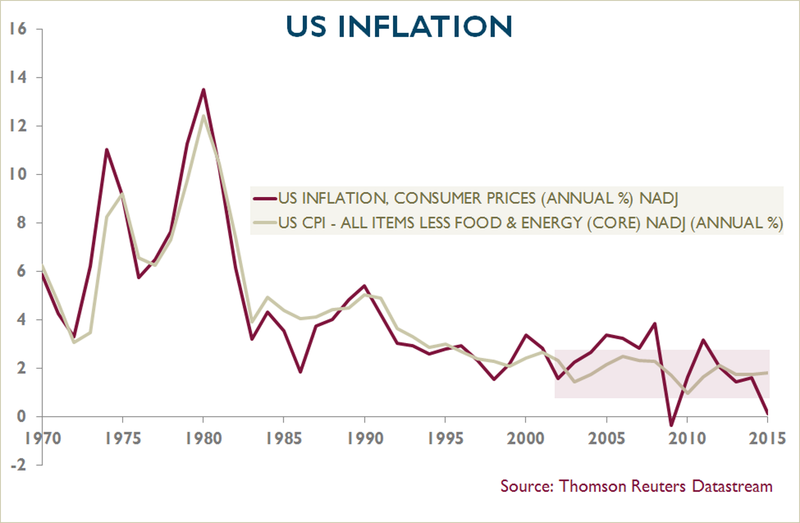 As noted earlier, core inflation, excluding energy and food, shows no obvious deflationary characteristics. As energy prices bottom and maybe even recover, headline inflation will move back up, potentially rising above the levels of core inflation. Is the decline in energy prices not just another symptom of a weak economy? Some have argued that the decline of energy prices is merely another sign of a shortfall in demand and hence a warning that deflation lies ahead. The evidence suggests otherwise. Global oil consumption rose by 2.0% in 2015, the largest increase in five years (and almost double the average growth rate of the past 25 years). Supply on the other hand rose by 3.2% with an extra 500m barrels/day production from Saudi Arabia, 800m barrels/day from Iraq and 1bn barrels/ day from the US. Nearly two thirds of the world’s increase in oil production over the past five years has been down to the US. 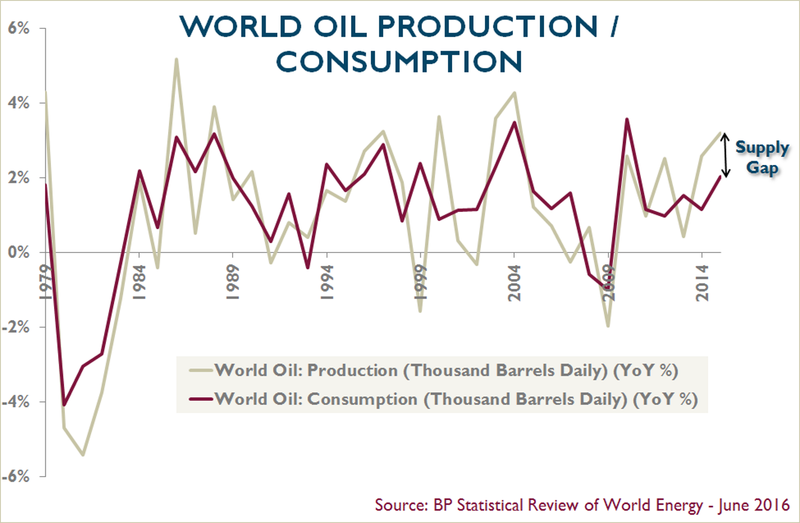 Lower oil prices are a response to increased supply, not to any shortfall in demand. The evidence from labour markets also points to the fact that the health of the global economy is strengthening. To be meaningful, any definition of sustainable growth has to include both nominal and real wage growth. 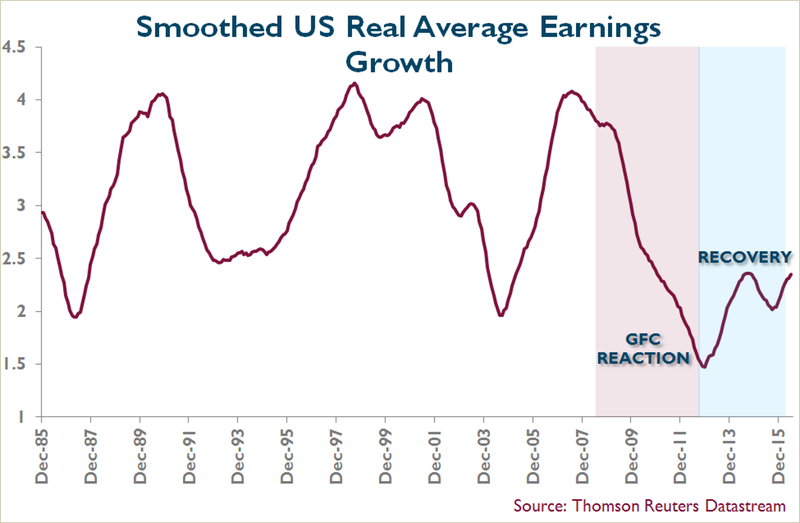 Average earnings growth turned negative in real terms in the immediate aftermath of the financial crisis. However, more recently wages have begun to recover as employment has increased and unemployment decreased. 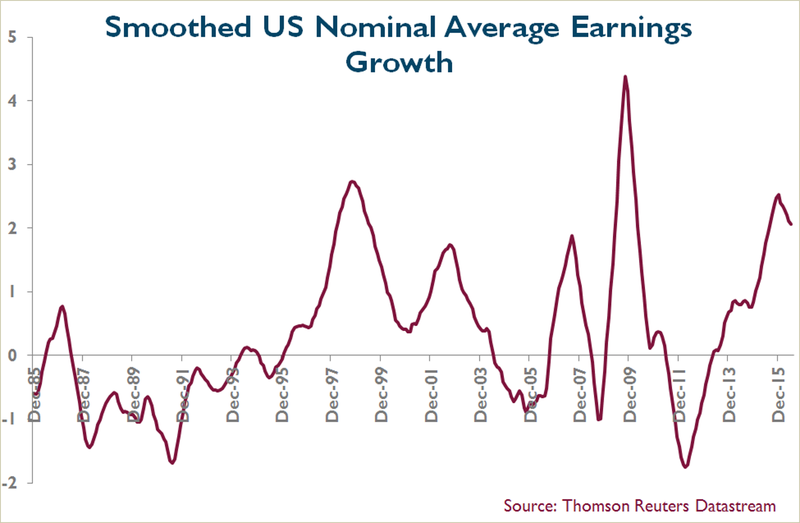 In the US, for example, both nominal and real average earnings growth have recovered back to their historic ranges. 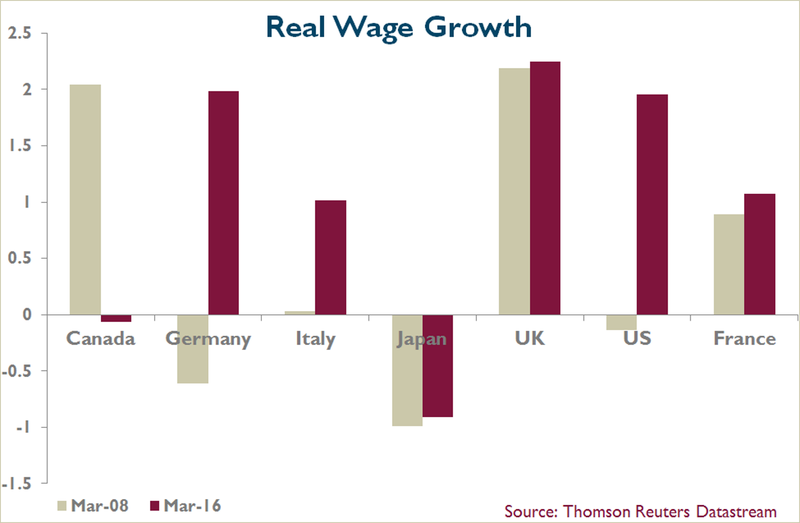 There is also evidence of improvement in real wage growth across the G7 group of countries. Comparing the data from March 2008 to March 2016, Canada appears to be the only real exception. Falling wages there reflect the impact of sharp falls in energy prices on its economy. Japan also appears to have experienced negative wage growth, but because of the differentials between part-time and full-time workers and their proportional share of the labour force, the figures mask what has in practice been wage growth of more than 1%. Taken together across the US, Japan, Germany and the UK, unemployment rates are now the lowest they have been in 25 years. Unit labour costs in the OECD have been rising at 1.0–1.5% since 2011, with Japan turning positive in 2014. Personal consumption has also begun to recover, apart from Japan where it has remained subdued. Although there are obvious differences around the world, the overall global economic picture is therefore one of moderate growth, improving labour markets and headline inflation which is set to rise to closer to 2% core inflation. The evidence strongly suggests to me that we are returning to normality. So there is no reason for policymakers not to start adjusting monetary policy accordingly? Given the economic evidence it is not obvious why unconventional monetary measures need to be continued. The spectre of deflation has receded. Some make the case for an extension of the policy on the grounds that many countries will need more years of nominal GDP growth in order to repair their debt overhang. I accept it may be right to retain a loose monetary policy stance as long as there is no evidence of inflation accelerating. But that does not mean that policymakers also have to go on deliberately suppressing the long end of the yield curve with additional measures such as QE. I’d put it this way: even if the patient is not going to be released just yet, it is time for him to be moved out of intensive care into a normal ward. And that I think is what is now going to happen. What happens to markets if you are indeed right in your assumptions? 1. Investors will once again require a real return on their investment, which means that government bonds in time return to offering a real yield of between 1% and 2%. 2. Those equities which have bond-like qualities and whose valuations are priced off bonds will react accordingly. 3. A return to more normal financial conditions will allow banks to make more money from their lending and give credence to the idea that we are back in a cyclical recovery. 4. The extended period of ‘growth’ outperforming ‘value’ will come to an end as the fear of deflation recedes. Given how substantial the distortions from yield suppression have been, it is likely that this process of rotation back to normality will be both powerful and protracted when it comes. What could prevent this being how the markets now pan out? There are clear signs that the policy adopted after the global financial crisis has served its purpose. The one element where doubts are creeping in concerns free trade, where threats to the consensus view of globalisation being a positive development have clearly begun to appear. For a number of reasons, including wealth imbalances, the time it has taken for wage growth to appear, a surge in migration flows and the unintended consequences of asset inflation, the world is now much more open than it was to inflammatory populist rhetoric. The outcome of the Brexit referendum is one obvious example. To the extent that the vote was not primarily dictated by economic issues, it remains a highly emotive subject. The danger is that it is a precursor of things to come. There have been previous occasions where populist sentiment has overruled economic common sense, with negative consequences. Populism inevitably rises during periods of economic instability. History records that the breakdown in global trade was one of the main contributors to the Great Depression. Although there were other factors, such as the gold standard, the US decision to impose tariffs through the Smoot-Hawley legislation engendered retaliatory responses and led to the collapse of trade. The bill was fiercely opposed by academics, industrialists and financiers at the time. President Hoover allegedly called it “vicious, extortionate and obnoxious”. Despite pressure for a presidential veto to be applied, the legislation was passed on a wave of populist support, leading to one of the worst periods in modern global economic history. The warning here is clear. Geopolitical mis-steps can cause sustained economic damage. That is why the US presidential election is a hurdle that needs to be cleared. Both candidates have increased their protectionist rhetoric, with Donald Trump clearly to the fore. Even if you discount this all as just pre- election posturing, the dangers of inflaming public opinion in this direction are obvious. Tariffs may not have caused the Great Depression, but they certainly were an important influence. A global drift towards tariffs and away from free trade would inhibit global economic growth and delay the return to normality that I am expecting. That is one of what I call the ‘ugly sisters’ still facing investors. The other ugly sister is competitive currency devaluation and one has to hope that this urge too is resisted. How confident are you that these trends can be resisted? Let’s say that I am optimistic but not certain. As an investor you can never be sure of turning points before they take place – if you wait till everyone thinks the same, it is too late to profit from them. However, making these judgments and having the patience to wait for them to unfold is what we are paid to do. Most of the comment these days seem to be about more QE and lower rates rather than the opposite. Does that not concern you? Yes, it is a concern, but I think this narrative is more about expectations that have become embedded over recent years than it is about a permanent role for central banks to prop up asset markets by reacting to any short-term economic worries with further liquidity injections. If we are in an environment where the financial sector has been repaired and the global economy is expanding, it is not appropriate for a central bank to react to every sign of short-term weakness (or strength). Only a long-term deterioration of the global economy and an undermining of the solvency of the financial sector would make this appropriate. The recent move by the Bank of England may be more about restoring confidence and propping up the Gilt market following the plunge in sterling than a signal of impending economic collapse. Certainly the imbalances in the UK economy make it sensitive to external investor perceptions and consequent capital flows. What changes are you making to your portfolios given your views? We are not making any changes. As stocks in the ‘bond-like equity’ category became expensive we sold them. They were replaced by stocks that are significantly cheaper. We did not expect that the expensive stocks would keep rising to the extended levels of today, but then judging a shift in investor psychology is very different from judging a shift in valuation. In the coming months and quarters the economic evidence will become increasingly difficult for the market and policymakers to ignore, and at some point there will be a rotation in markets which corrects the imbalance in valuations.